In early days, video recording, video post production, and video archives all run on magnetic tapes. As digitization revolutionizes the world for the past decade, it has profound influence on media and broadcasting industry as well. The gap between tapes and digital media is closing fast and even it’s been replaced totally. For example, CRT TV has been replaced by LCD(LED) TV. Display technology marches towards larger size and higher resolution. This directly impacts the video recording appliances and forces them to adopt digitization as the mainstream. GTV foresees the technology trend and acts as a role model in Taiwan broadcasting industry to adopt high performance iSCSI disk array systems from Qsan Technology in video archive infrastructure to satisfy full HD high definition digital content and to accommodate the future requirements of fully digitized high definition broadcasting platform. With more TV channels emerging and better and richer TV program content provided, people are expecting higher and higher quality. GTV uses MPEG2 format with 150Mbps stream rate to store high definition source content. This equals 50GB video content per hour. GTV owns 6 channels and the overall program hours reach 10000 hours per year. This translates to 500TB capacity requirement to store all channel programs for the whole year. Currently GTV has more than 40000 hours of video content to manage, which requires huge throughput for read/write access to cope with the daily production needs. Because every bit of the source content needs to be stored for future inquiry and post production and you need to factor in data redundancy for security concerns, with 6 channels in production, it takes an awful a lot of capacity to store these media content. 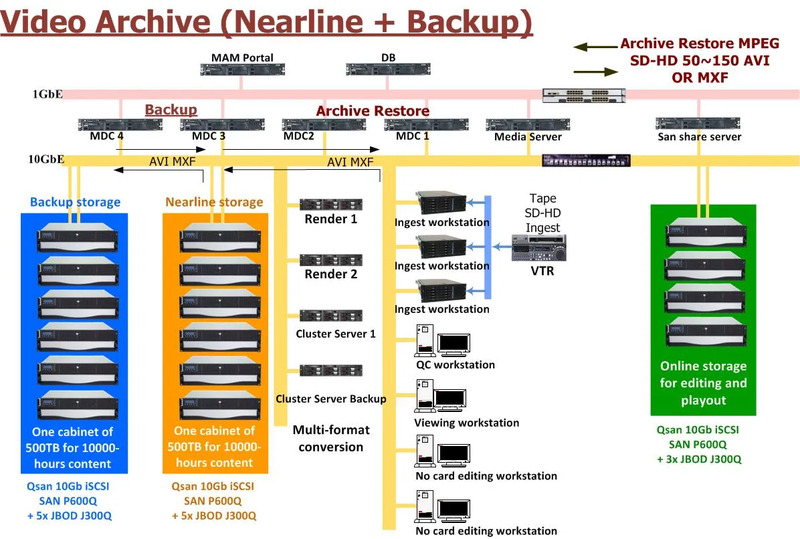 Data redundancy is created by using a mirrored structure of nearline storage for video archive and backup storage for its mirrored copy. To achieve this requirement by using HD tapes would set you back with astounding prices. Neither can HD tapes provide non-linear multitasking function. Using LTO(Tape Library) or rewritable Blu-ray disk, they can’t meet the performance, easy management, and storage design requirements because of the natures of linear storage appliances. GTV has been looking for a total solution that can lower purchasing costs and increase performance, efficiency, and security to store valuable media assets. AegisSAN LX P600Q, 10Gb iSCSI array can fully satisfy GTV video archive requirements. The RAID controller is equipped with Intel® Xeon C5500/C3500 dual cores processor with XOR hardware RAID engine and Intel®82599 10GbE dual ports network controller silicon. With dual controllers, P600Q can deliver 40Gb bandwidth to process the huge workflow of uploading, downloading, and transcoding running at the same time. Active-active dual controller mode provides high availability and fault tolerance to ensure 99.999% service uptime. Overall capacity can be expanded through mini SAS 24Gb expansion port on each controller to daisy-chain JBOD enclosures for up to 256 hard drives. GTV’s video archive infrastructure uses its own MAM software (Media Assets Management) along with two rack cabinets. Each cabinet houses one P600Q-S316 and five J300Q-C316 enclosures. One cabinet is for nearline storage and the other is for backup storage. Both cabinets are mirrored together to provide the highest data security. Enterprise 4TB SATA drives are deployed with RAID 6 and two hot spare drives. 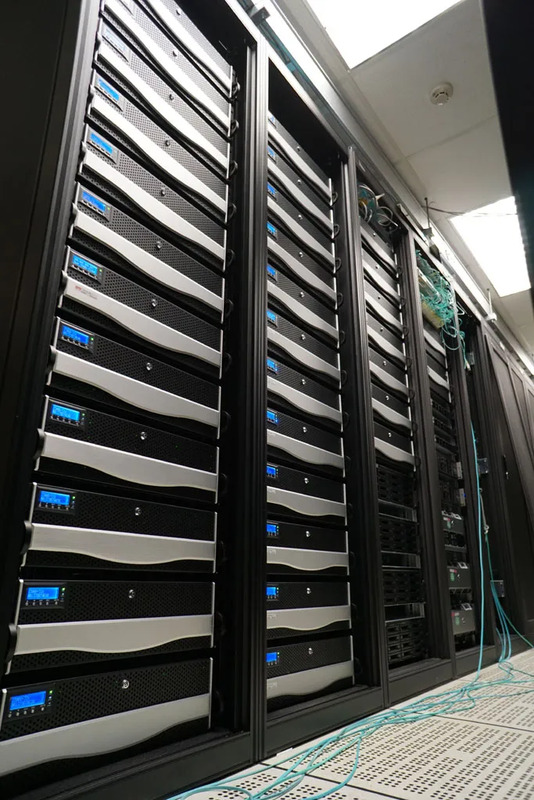 The overall capacity per rack cabinet comes to 500+ TB, which equals to 10000+ more hours of high definition (MPEG-2 HD, 150Mbps) video recordings. The TCO (Total Cost of Ownership) per GB can cut down 1/3 of its original cost. 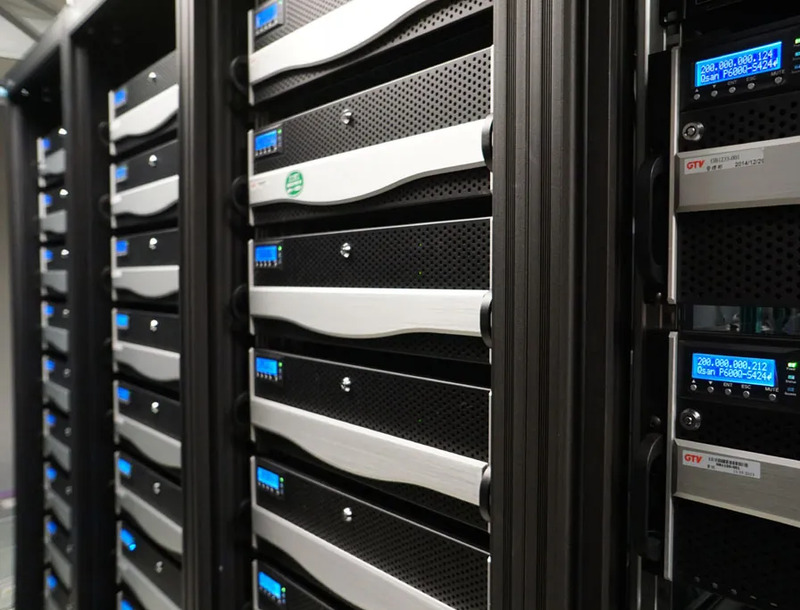 Besides, as 6TB drives and 8TB drives get more popular and even 10TB drive would be launched next year, the same rack cabinet can house storage capacity over 15000 hours of high definition video recordings, which pushes to even lower cost per GB. Compared with magnetic tape, it costs around US$50 to record one hour content. Compared with Blu-ray disc, it costs around US$25 to record one hour content. However, using hard drives, it costs about US$10 to record one hour content. So the money should be spent wisely. Thomas said “In addition to the cost concern, the most important thing is that P600Q can provide 40Gb bandwidth and excellent performance to fulfill the requirements of high definition video management. P600Q also provides an array of enterprise features such as virtual disk snapshot and remote replication, which provides thorough data protection. Thin provisioning can help allocate storage space more efficiently without wasting. In the latest firmware release, even SSD caching function is provided to help users harness the power of SSD drives to boost the performance of random data access. With Qsan unique iSCSI offload engine technology (QiSOE) and Intel® Xeon XOR RAID engine, P600Q can outperform any other competitors with the same hardware components. Joseph Chiu, director of Digital Source Technology, said “Ever since we purchased Qsan iSCSI SAN solution, GTV can run its video archive infrastructure with high stability and high availability. Based on this foundation and mutual trust, we will keep ordering more Qsan iSCSI SAN storage systems to expand overall GTV storage capacity to include online editing and broadcasting applications.” Digitization and high definition are the future trends to video media industry. Only disk array systems with high capacity hard drives can fulfill the needs of MAM software and non-linear multitasking post production. High speed iSCSI IP SAN disk array systems will be the ultimate weapons for TV stations and media broadcasting industry. Founded in 1996, GTV Television majors in four cable channels and business related to video media production. Among hundreds of cable channels in Taiwan, GTV is one of the bests in terms of TV ratings, penetration rate, and TV program production. There are four hundred employees in GTV Television. We have professional departments dedicated to produce the best quality TV programs in Taiwan and seek cooperation with Japan, Korea, China, and Asia Chinese society to expand international businesses. Qsan Technology was founded in 2004 by a group of experienced engineers who wanted to build top-notch storage systems. With outstanding performance, completed data protection, and smart data management, Qsan’s storage systems will be the worldwide best without compromise. Qsan storage solutions have been deployed globally and trusted by organizations’ businesses of all sizes and locations; furthermore, Qsan is a recognized global leader in the storage industry and the leading developer of data management and protection. Our customers can focus on building their business with award-winning data storage product lines combined with dedicated global service and support from Qsan Technology.